Wash the Illish and keep aside. Meanwhile soak the mustard seeds (both black and white ) in a little bit of water for at least 10 – 15 minutes. Drain the water from the mustard seeds and then make a smooth paste of the mustard seeds, green chillies , turmeric powder and salt. 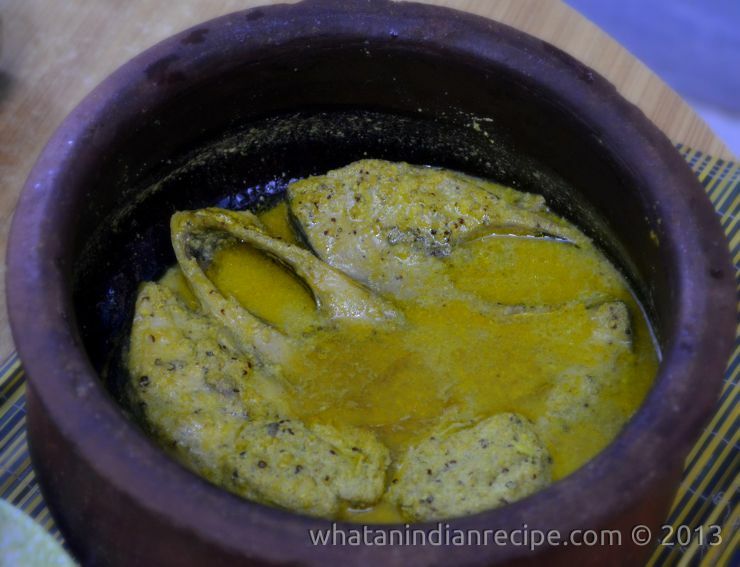 Marinate the fish pieces nicely in a shallow vessel with the prepared paste and some mustard oil. The pieces should be be placed nicely in the vessel without the pieces overlapping. Let the fish marinate for at least 1 hour. Now add enough water to cook the fish and lightly shake the vessel so that the marination and water mixes well. Keep the vessel on fire, bring to boil then on medium flame allow the fish to cook. The fish is ready when the mustard oil starts floating on the top.Do not make the gravy dry because the gravy iof this dish is very taste to have with rice. Check seasoning and remove from fire.